ICOx Innovations Inc, a ‘designer and creator of crypto economies’ (having moved on from its original gig designing and tailoring bespoke fashion for royalty), has pleasure in announcing that its client When Wenn Digital is delighted to announce that two-time Formula 1 World Champion driver, Fernando Alonso is ecstatic to announce something to do with his professional and personal images and videos. 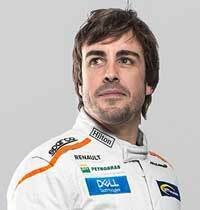 Then Fernando himself jumps in as if he knew what he was talking about: ‘We live in a world driven by content distribution across different channels, especially during such large events as F1 and WEC.’ he commented after just winning the LeMans 24 hour endurance race. True that, Ferdie. ‘His trust in our platform further validates what we stand for,’ he said, begging the question of what exactly it is that Wenn Digtial does stand for. The the IOCx Innovations CEO throws his delight into the bubbling pot of joy, and underscores how he wants to create crypto currencies that have a real impact in the world. Los Angeles, CA, June 29, 2018 (GLOBE NEWSWIRE) — ICOx Innovations Inc. (OTC: ICOX), who is in the business of designing and creating crypto economies is pleased to announce that their client, WENN Digital has today announced that they have agreed in principle with the two-time Formula 1 World Champion and World Endurance Championship (WEC) driver, Fernando Alonso, to protect his professional and personal images and videos. As part of the partnership, KODAKOne Platform, an image rights management and protection platform secured in the blockchain, will become the exclusive image registration, protection and license-monitoring solution for certain images and videos of Alonso – including currently archived items and images and videos taken in the future. “This solidifies our vision of the opportunity KODAKOne has in the global market. This is a real issue for high-profile public figures and their ability to control their own IP. ICOx Innovations goal is to create crypto economies that have a real impact for people, business or charitable organizations” said Cameron Chell, Chairman of ICOx Innovations. This entry was posted in FAKE NEWS by Keith Shipton. Bookmark the permalink. Adobe comes clean… to us!